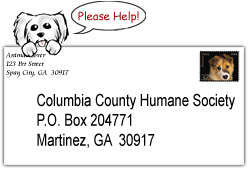 If you would like additional information about our organization, volunteering or making donations, or any of our wonderful animals available for adoption, there are several ways you can contact CCHS. 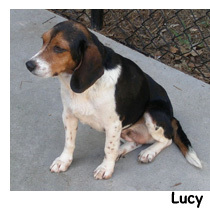 If you would like additional information about a specific dog or cat available for adoption, you can speak directly to that animal's foster parent by either calling or visiting Petco located in Mullins Crossing, 4209 Washington Road, Evans, GA. Our adoption sessions are on Saturdays from 11:00 - 4:00. Our foster parent volunteers would be happy to answer any questions that you might have about the animals under their care, and each foster parent manages the adoption process for their animals. Please Note: our foster families rotate the animals they bring to our weekly adoption sessions. Thus, you may wish to call the Petsmart in advance of your visit to ensure that the specific animal (and foster parent) that you are interested in meeting is there that day. If you call, just ask for Columbia County Humane Society. If you have general questions about CCHS or are interested in volunteering or making a donation, you can contact us by phone at (706-860-5020). Since we are an all-volunteer organization, in can sometimes take our volunteers a few days to respond, but we will try to get back with you as soon as possible.